home improvement | Is this load bearing? 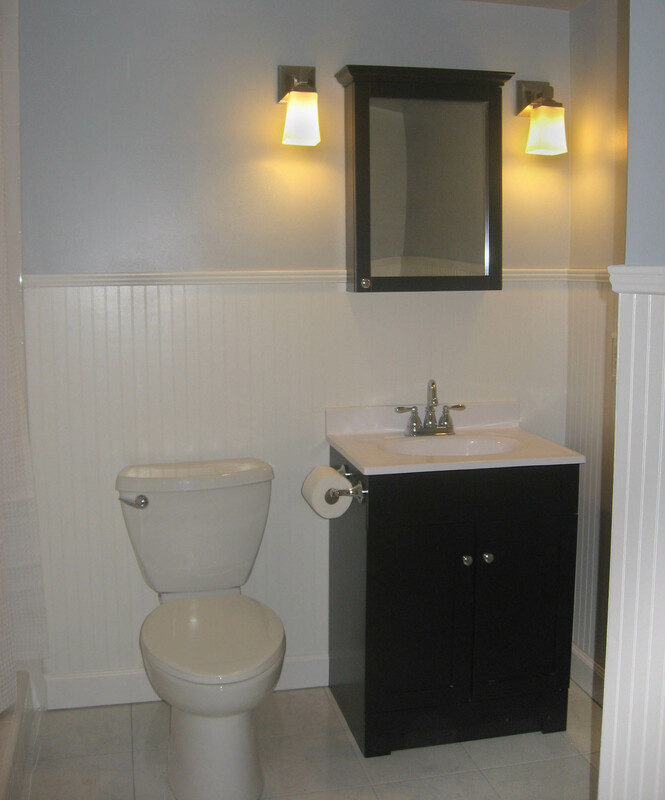 I really like the board and batten look that is so popular right now. It is fairly easy to do and the results are quite impressive. Like the rest of our house, the stairway leading down to the basement had become dated (not to mention squeaky!) I thought this would be a good project to hone my carpentry skills and try to achieve the look I so admire. 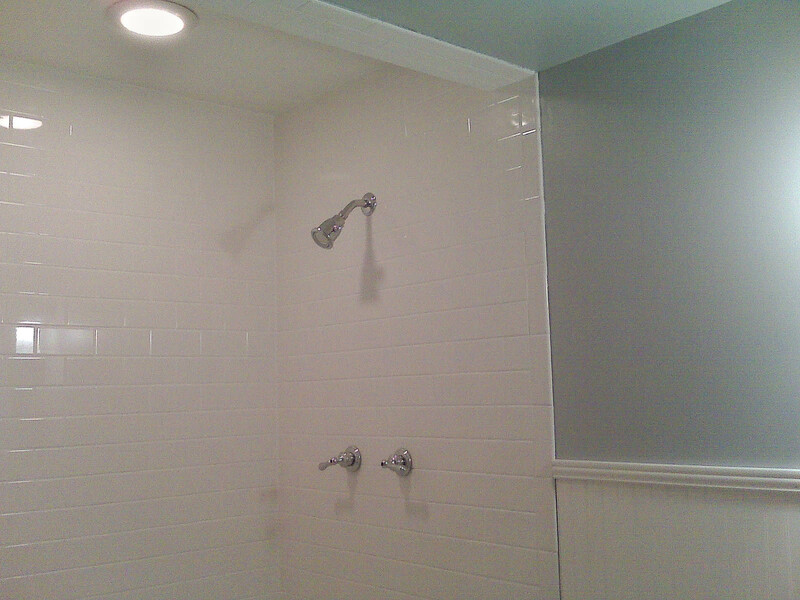 As usual, I failed to get a “before” shot until after we had already done a bit of work. In this case, we had ripped up the old carpet, and patched a lot of nail holes in the wall. 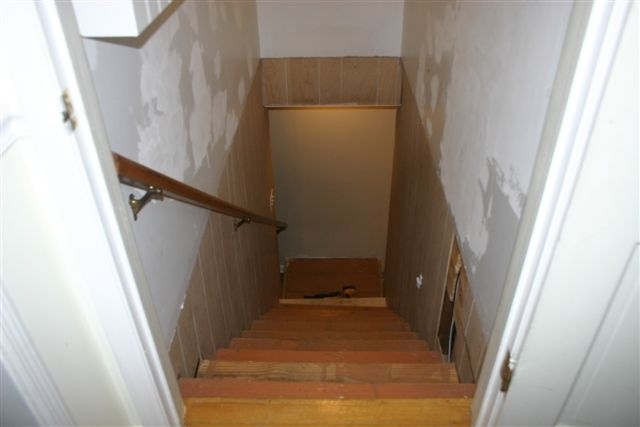 Then we had to decide if we were going to keep the old stair treads or rip them out and start anew. We voted for the latter and out they came! Any excuse to use a crow bar, right? Seriously, we did this for two reasons: 1) The stairs had become very squeaky, and it wasn’t just one or two stairs — it was every…single…one. We figured it would be easier replacing them than trying to fix all the squeaks. 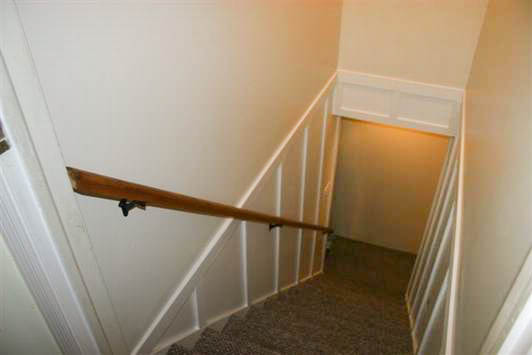 And, 2) We wanted to install a stair “skirt”, which is the equivalent of baseboards for stairs. 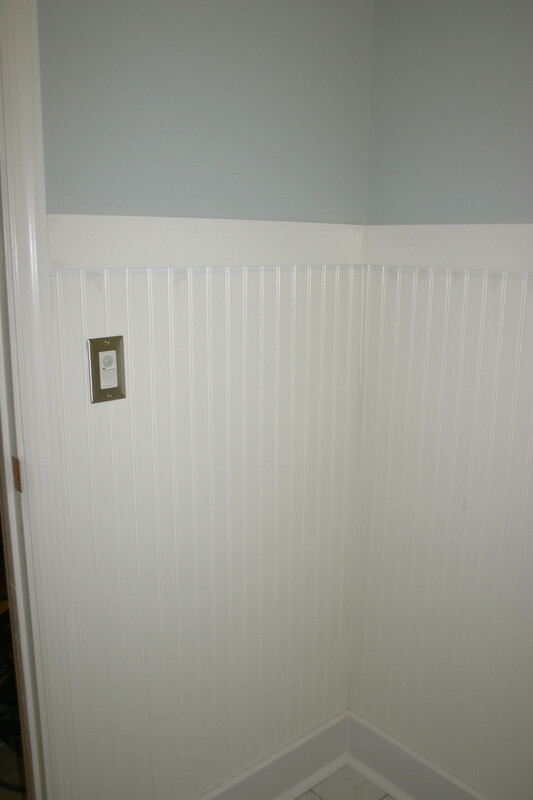 This would add a unifying element and tie the new board and batten trim to the stairs. 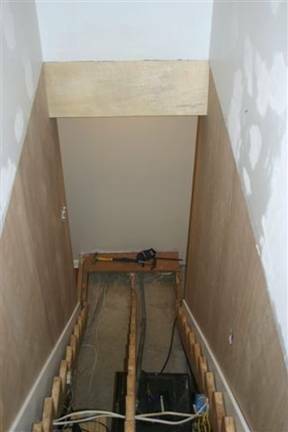 The stair treads and risers came out easily and we were left with the stair stringer and a eight-foot drop! Luckily, this was a weekend project, so we were not without stairs for long. 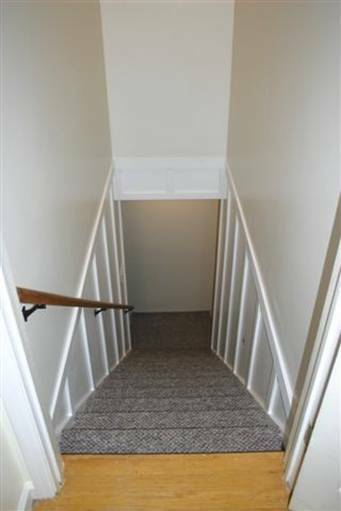 We ended up replacing the stair treads and risers with a contractor-grade composite material since we opted to carpet the stairs. (This was much cheaper than the stained oak treads I had hoped for–but cheap won out in the end). Before we could cut the new treads, we needed to install the skirting, which consisted of a 1 x 10 piece of lumber on each side of the stair case. Once that was in place, we could cut our treads and risers to size. 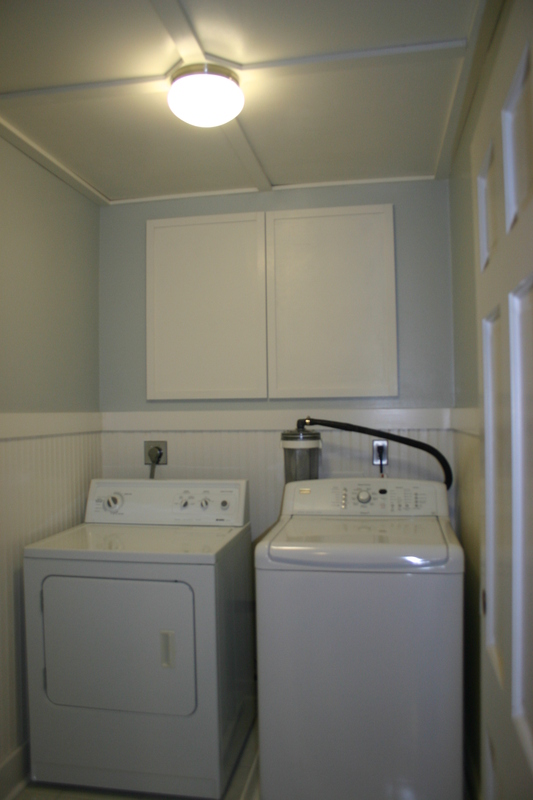 Our laundry room was another part of our basement renovation. 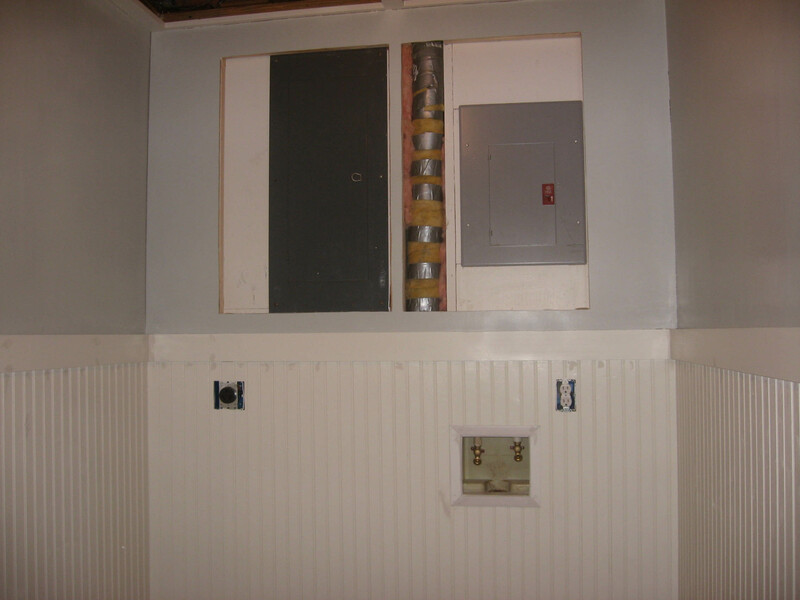 It was originally a small panelled room with two electrical boxes, which is all I saw when I looked in the room. 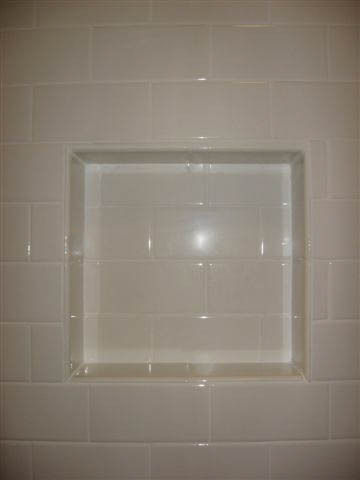 I did not think to get a good “before” shot. I took this one after we had removed the panelling, ceiling, and floor tiles. 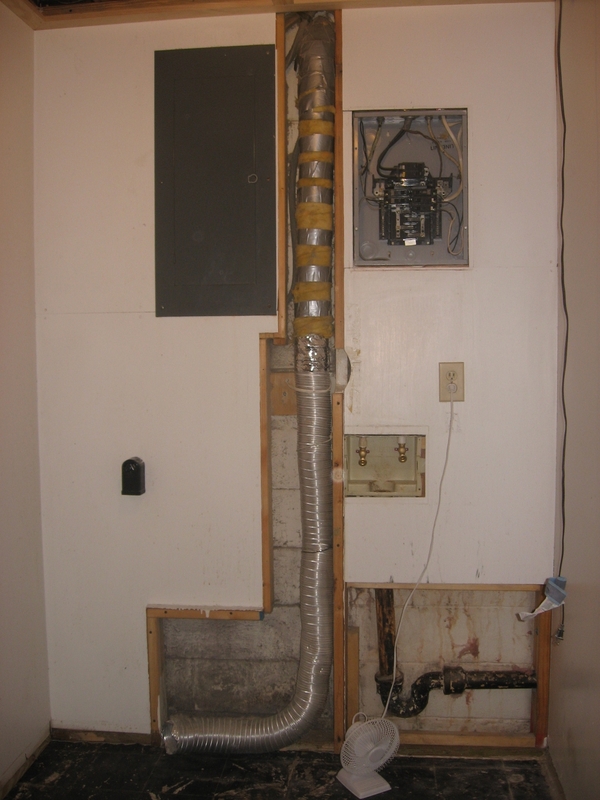 It’s difficult to see in the above picture, but the exposed vent and pipe areas extended out about an inch from the wall. We wanted everything to be flush. (I also wanted to do something about those electrical boxes). We ended up shimming out that wall to make everything even. 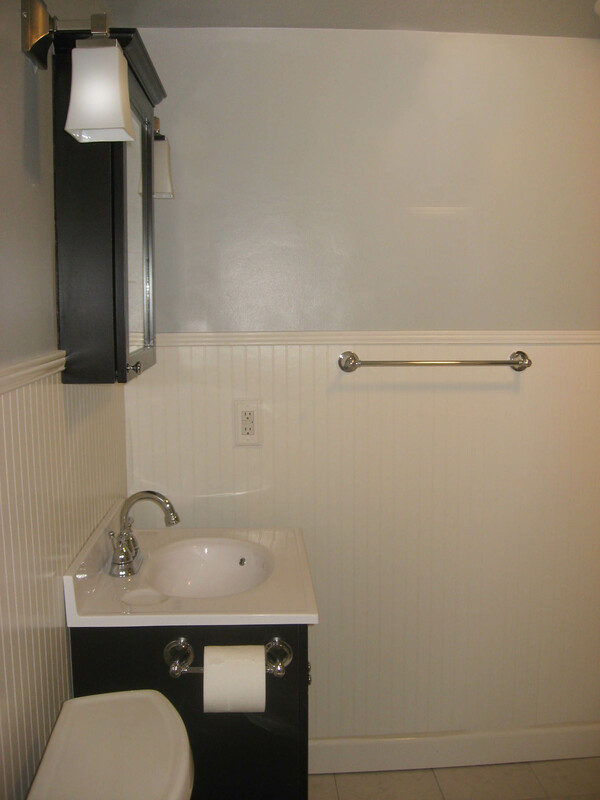 Then we installed the bead board panelling. 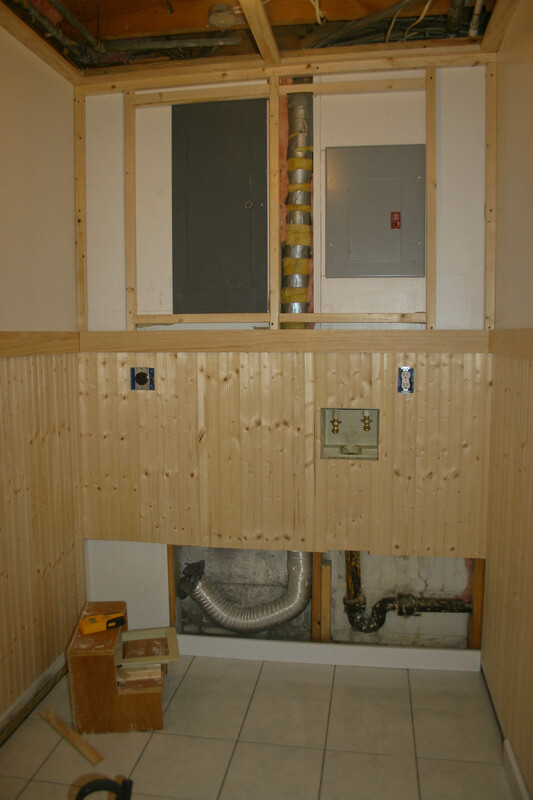 Instead of sheetrocking the ceiling, like we did the rest of the basement, we did a variation of a suspended ceiling that still allows access to wiring and vents–much less dust! 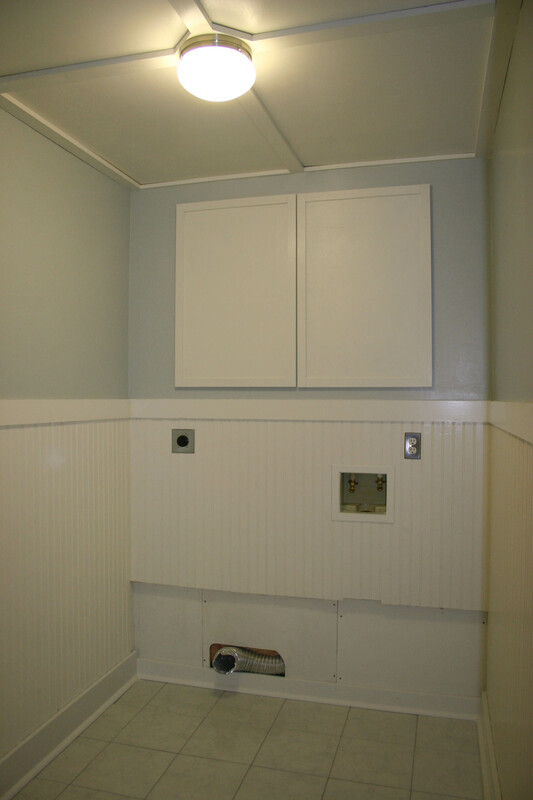 We also built doors to cover up the electrical boxes to make it look a little more uniform. We had some left-over tile from the bathroom, so we used it for the floor. The baseboards are a type of pvc material that is used for exterior applications. It will not rot, and is paintable, so we thought it would be a good choice for the laundry room. Here is a shot of the other side of the room. (It’s a small room). And then it was time to move the washer and dryer in and start washing those clothes that had piled up while we finished this project!